Well, the fence around my house that was knocked down by the hurricanes is being replaced this week, 7 January. It will take a while before things are back to normal. Speaking about back to normal, the new External Tank arrived at Kennedy Space Center as did some other space hardware. We are back in the business of putting Space Shuttles together and preparing them for launch. If we meet all deadlines and no major hits arise, we’ll launch in May. 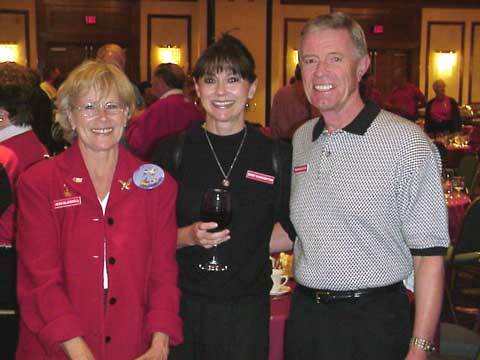 I needed a 3rd photo, so here's a shot of Jean Blaisdell enjoying a moment with Ginny and Bob McNaughton. Let’s start with an update from Jack Swonson. "Just a note to let you know we're alive and well in Phoenix. Polly Ann and I will drive to Pasadena for the Tournament of Roses Parade this weekend. Son Jack will retire from the Texas ANG this next year (can't believe how time flies by). Fred Fiedler and I are working together on a capital campaign for Project ChalleNGe, a bootcamp-type program operated by the National Guard to get wayward teens back on track, earn a diploma and get into college, the military and/or the workforce. I played golf last week with Ted Hopkins (class of '60), Hoppy's (Bob Hopkins) brother, who lives in Scottsdale. Doesn't understand why Hoppy and I haven't retired yet. I'm still heading the USAA Phoenix Office; we celebrated the grand opening of the permanent campus last month and went over the 2,000-employee mark. I'm planning to ski a few days in January with Jim Gallagher and several other Red Tags. They've had terrific snow this season; should be great fun." Thanks for the news, Jack. Enjoy the ski holiday. Got an email from Paul Landers. "As you may remember, I retired from Amway/Alticor, and we moved to Tyler, TX, where we were building a home on a lot we owned at Eagle's Bluff Country Club. I was offered the chance to head the Air Transportation Office for Ford Motor Company. They have some jets at the Detroit Airport, and several in London England. It was too good to pass up, so Jo Anne and I have locked up the Texas home and are living in Dearborn MI. The job is interesting, and it's great being around airplanes. (I once said to someone in passing that aviation was my first love. Jo Anne corrected me right away.) When I retire for the third time, we will return to Texas; in the meantime, we are having another adventure and enjoying life. Hope all is well with the Jambas. I sympathize with your plight with hurricanes, as described in the last Checkpoints. I hope you are now immune for a number of years. Paul ". Thanks, Paul, for the news. Sounds like a great job. Enjoy! Now a word or two from George Thompson. "I have retired from my Headmaster position and plan to return to teaching in Russia at the Pskov Volny Institute, where I was for most of the 90's. I will leave the US around Christmas and return in June. Meanwhile, I am playing bridge about 3 times a week, singing barbershop and generally enjoying NOT being on duty 24/7! I follow the news, especially of USAFA, and regularly read and correspond on the Blathernet. Coli (Richardson) has really provided a great service for those of us who want to take the time. Haven't seen anybody but Robbie (Warren Robbins), who's still pushing real estate in Seattle. He's getting old and grey while I remain my youthful self (except for the replaced hips, creeping arthritis and short term memory loss.) Cheers Jack!" Thanks for the news. Good luck on your return to Russia. Let me know if you can arrange one of those group trips to Russia such as you mentioned two years ago. Owen & Connie Hawkins spent a lot of time on camper trips around the Far West. 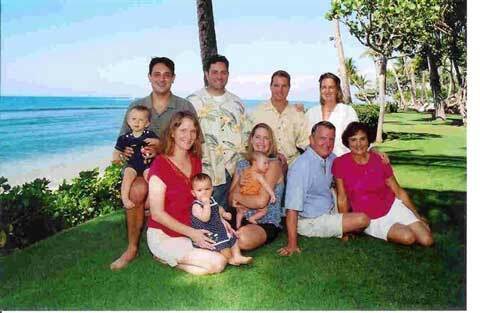 They also arranged a family vacation on Maui. (See picture). More camping trips are planned. And I got an update from Randy Schamberger. You may remember from the last Checkpoints, that Randy had surgery to reattach a bicep tendon and heart surgery for calcification in his aorta. After those two adventures, he survived the onslaught of the hurricanes with very little damage. Here’s the continuation of his story. "I finally had the chance to begin playing tennis on the 6th of October. Two days later I was in the emergency room at the Eglin AFB Hospital for an emergency appendectomy! I had complications following the surgery where my intestines shut down. I was put on IV and had a stomach tube inserted. What a horrible experience that was! I would choose 10 heart valve replacements before I would undergo that procedure again. After the tube was removed I was given a liquid diet which I tolerated so I was given permission to eat a regular meal for lunch. Guess what? It was Mexican Lunch Day at the hospital! Well, I ate about 2/3 of it and tolerated it, so they sent me home. At last! But I lost 10 pounds from the ordeal." Randy is in good health and doing well, having survived his year in hell. Got some healthier news from Jim Gallagher. He talks about the ski week planned in just a couple of weeks. Let’s read his words. "Hello Redtag skiers. We currently have an 80" base and 237" total snowfall. That's outstanding for this time of the year. We skied Wednesday in a blizzard and then it suddenly warmed up and I skied in shorts the next day. I've skied 22 days this year. Utah is a great place to retire! How good is it? Well - one of my friends shot a deer in the morning, did a little fishing, played 18 holes of golf, and still had time to shoot some ducks in the late afternoon. Just get your reservations in to the Crystal Inn and make your plans to be here the week after Presidents' Day." Thanks, Jim. Tune in next issue for the next chapter of this exciting saga. Now the latest from Sam Dehne. He sure knows how to write publicity script to catch attention. "Sam's band reached the 800 concert plateau in 2004: The Too Wild Yankees Band puts the "D" in Dance... with high-fallutin' rootin' tootin' singalong numbers that have a rockabilly sound all their own. From the unique semi-twang vocal-stylings of lead singer and guitar player "Singing" Sammy to the equally talented heart-throbbing beat of national champion "Indiana" Tommy Clark's harmonica, whistling, and Djembe drum. These two entertainment virtuosos take the audience on a ride from Country... to Rock n Roll... to Patriotic... to Sunday Go to Meeting songs... that literally force young and old audiences to sing along, tap their toes, and twiddle their fingers." Thanks for those words. Great stuff, Sam. Next comes a few thoughts from Butch Viccellio. "Sumo...hope you guys had a great Christmas. 2005 promises to be a biggie for us, as we are going to hang it up here at USAA in Feb and relocate in May to the retirement spot on Bainbridge Is., WA, we purchased for this purpose 26 years ago! A long time coming, but NO MORTGAGE!! Anyway, one lingering thing I am doing is hosting a USAA cruise in August around the British Isles...Wales, GB, Scotland, Ireland...13 days or so, leaving from Copenhagen. We are going to attend the Tattoo ceremony in Edinburg castle, etc. For those who might be interested, contact me. PS: Really hope the Jambas could come....Butch " If he can get a class address list, you will all probably have gotten an invitation by the time you read this. If interested, contact Butch directly. Good luck on the retirement to Washington. Heard from Tom Moore. He and Virginia went on a tour in June around the Pacific Rim. 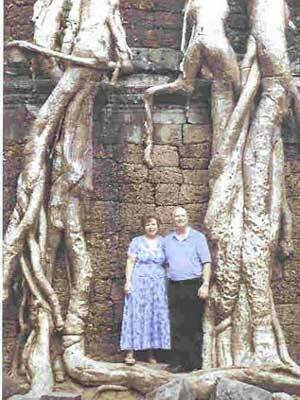 See picture of them in Cambodia. The kids are doing well and life seems to be cheery. Heard also from Bill and Sue Haugen. They made several trips this year around the country to see friends and relatives. Bill is still enjoying being a docent at the new Air & Space Museum. Larry & Penny Gooch went on the Redtag cruise in the summer. Larry is almost fully retired and Penny is still involved with quilting. They travelled a lot, too. Willie and Nancy Gray did lots of travel to Monterey Bay (on Son-in-law’s sailboat), Minnesota, Las Vegas and other points. Nancy still teaches part time and does quilting. Charlie and Mary Jo Price are well-adjusted retirees. Charlie has a new S-2000 Honda sports car. It carries his golf clubs. Mary Jo does church work and plenty of bridge. John & Judy Dinsmore also have lots of grandkids to spoil. John is bldg superintendent for his church and Judy loves quilting. Well, that wraps it up for another issue. Keep the letters and emails coming. Go Redtags!